​Cothrom Ltd is a Community Learning and Development Organisation based at Ormiclate on the island of South Uist in the Outer Hebrides. It serves a population of approx. 6,000 spread across 9 islands that stretch for 80 miles from Berneray to Vatersay. Cothrom has a small satellite learning centre on Barra. Set up as a Company Limited by Guarantee, Cothrom is a Registered Charity, community owned and managed, with 650 local members drawn from the communities across Uist and Barra. Each year the Company holds an Annual General Meeting at which members elect Directors who serve as members of the Board. An enterprise which is committed to improving environmental practices within the organisation and the wider community. In 2017 Cothrom celebrated a range of milestones: its 25th anniversary as an organisation and the 10th anniversary of its purpose-built learning centre. In 2017 Cothrom also opened its purpose-built recycling centre next door to the learning centre. Over the last decade Cothrom has been a successful social enterprise generating about two-thirds of its income each year through trading. Set up initially in 1992 to support women returning to work, Cothrom has grown into an established SQA accredited training provider, with a diverse portfolio of opportunities for adult learning and skills training. Cothrom moved into a purpose-built learning centre in 2007, which includes a Gaelic medium pre-school nursery, Cothrom Òg. Each year Cothrom has about 200 learners engaged in adult learning, employability programmes, SVQs, and Modern Apprenticeships. In 2006 Cothrom set up a furniture recycling and restoration enterprise as a supported Intermediate Labour Market to provide opportunities for adult learners with additional challenges, especially those who could not find work placements in local businesses. In 10 years ReStore has grown into a significant social enterprise diverting furniture and textiles from landfill, providing work experience and mentoring opportunities, and delivering training in a range of skills, especially in its new purpose-built premises opened in 2017. Over the last decade Cothrom has also served as a community anchor organisation, supporting local development initiatives and community organisations, hosting Local Development Officers, undertaking research on the local economy and influencing economic development policy, extending mentoring and coaching opportunities well beyond its own learners, and being a venue for community groups and events. Here at Cothrom we offer an informal, relaxed and friendly approach to training. We deliver recognised certificated courses as well as customised packages to suit your individual or business needs. 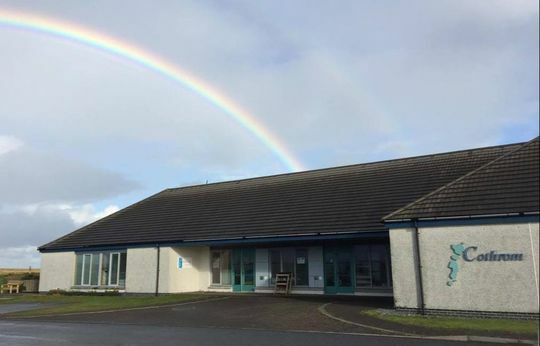 Our learning centre is in the middle of South Uist and we are also flexible enough to deliver training off site, managing courses at a time and pace that will allow you to achieve the learning outcomes that you desire. Scottish Vocational Qualifications we offer include Business and Administration, Horticulture, Hospitality, Management, Social Services (CYP), and Social Services and Healthcare. Please click the relevant qualification for more information. Other training courses we offer include PC Passport, English for Speakers of Other Languages, Employability Fund, and Adult Learning. Built with access as a priority the Centre comprises a single-storey building with wide corridors. It has induction loops fitted in many rooms, and the site has ample car parking including disabled spaces to enable further ease of access to the building. The boardroom is the largest space and can seat up to 50 people conference style. The room contains an overhead projector, TV/DVD, and an interactive smartboard - a brilliant extra if you wish to deliver a talk or presentation. The spacious workshop can accommodate a large number of people for practical skills sessions. Features include non-slip flooring, ample benching, and stainless steel sinks. Workshop rooms include woodworking, painting, and textiles. The Training Room is one of the most popular rooms. An ideal size, it comfortably accommodates up to 12 people. Due to the layout of the room it can easily be fitted with any required extras and is perfect for the more informal and relaxed meeting. please call Cothrom on 01878 700910. Visitors and local residents are welcome to use our internet service. Our computer suite has 8 computers ready to let you surf the web. There is a minimum charge of £1 for use of our internet service.